Bee Loved Face Cream fights the signs of ageing and the damage caused by free radicals using a powerful combination of antioxidant rich, active ingredients that are gentle enough for sensitive skin and dry skin conditions. With a subtle scent and thick, luxurious texture that glides effortlessly over skin to nourish after cleansing, Bee Loved’s blend of chemical free, active ingredients including Sunflower Seed Oil, Bees Wax, Shea Butter, Evening Primrose Oil, Aloe Butter, Vitamin E, Chamomile, Lavender and Rose Oil penetrates deep into the layers of the skin, feeding, nourishing and deeply hydrating skin, calming redness, evening out blotchy and dark patches and softening from the very first application. Skin looks well hydrated, the appearance of fine lines are reduced and skin feels firmer, softer and more supple. 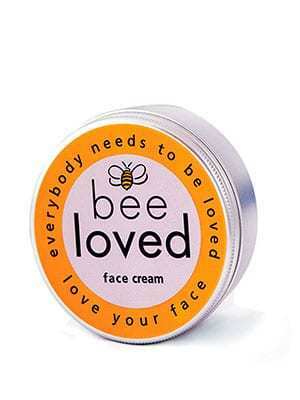 Bee Loved’s Face Cream is easily absorbed and provides an excellent based for make-up with no greasy residue and a smooth, even finish. It can applied both as a day and night cream and used with confidence on dry, damaged or problem skin.